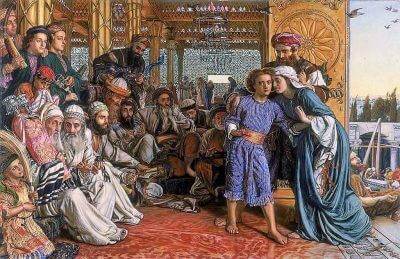 As our Blessed Mother stood at the foot of the Cross, she may have recalled that time when Jesus, at age twelve, stayed behind in Jerusalem for three days. Our Blessed Mother and Saint Joseph returned to Jerusalem and searched diligently for Jesus. Finally, they found Him in the temple with the teachers and religious leaders. At that time, while the Child Jesus was among the teachers of Israel, they were greatly impressed by Him. He asked them deep and probing questions and manifested a wisdom beyond His years. Scripture says that “all who heard him were astounded at his understanding and his answers” (Luke 2:47). Painfully, just two decades later, Our Blessed Mother watched these same religious leaders question her Son over and over again. During those three years of His public ministry, Our Blessed Mother saw that the religious leaders turned on her Son, seeking to trap Him, accuse Him and discredit His profound wisdom. What a difference the years had made. What they thought was interesting coming from a twelve year old, they interpreted as threatening coming from a thirty year old. The religious leaders now were jealous and envious. And it was primarily on account of their new malice that she was standing before her crucified Son, gazing at Him as He offered the sacrifice of His human life. In our own lives, we may find that people turn on us as we grow closer to our Lord and our Blessed Mother. We should expect nothing less than the same treatment that Jesus received. People who were once our friends will, at times, become our greatest persecutors. Reflect, today, upon any experience you have had with those who have turned on you or betrayed you on account of your faith in Jesus. Though not everyone experiences this to the same degree as our Lord, when it is experienced it can be a source of confusion, hurt, anger and even despair. As our Blessed Mother watched the cruelty toward her Son unfold, she would have forgiven those religious leaders who treated Him this way. She would have shown mercy to them and prayed for them in the midst of her own suffering. We are called to do the same in imitation of our Lord and our Blessed Mother. My dear Blessed Mother, when Jesus was only a Child, you were amazed at the reaction of the religious leaders in the temple as they listened to Him and were astonished by His wisdom. You also saw those same leaders turn on your Son during His public ministry. You watched their affection for Him turn into loathing and their amazement turn into jealousy. My dear Mother, when I seek to act as an instrument of your Son and to speak His words of wisdom, not everyone accepts these words. Pray for me that I may always forgive and accept misunderstanding and ridicule with the same faith and hope that you had as you stood before the Cross. Precious Lord Jesus, You never ceased proclaiming Your perfect wisdom and love to the world. Though many accepted Your words, many did not. Help me to know that I am called to follow in Your footsteps. Help me to never be scandalized or shaken by the persecution of myself or another. Keep me faithful to You and faithful to the proclamation of Your holy Word.